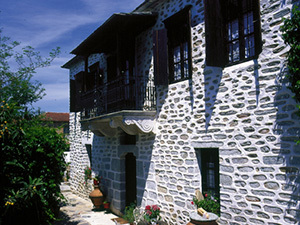 A few meters from the village square is the main building of the business, a two-storey renovated Stone Mansion of 1883, which has a total of five double rooms. On the ground floor is the reception and a double room with two (2) single beds. On the first floor there are four double rooms with a double bed. The Mansion is surrounded by a large space with its flower garden, swimming pool with table area and sun loungers, as well as wireless internet access (WiFi). The * swimming pool operates exclusively in the summer season for the months of July, August and September. It is accessible only to the guests of the accommodation and there is a working hours from 09.30 – 14.30 and from 17.00 – 19.00 daily for the whole period of its operation. 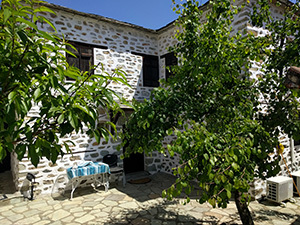 A few meters from the Central, at about 100m is the second restored stone mansion of 1893 with total capacity of three (3) double rooms, with kitchen area (kitchenette and fridge), dining room, TV lounge and fireplace. On the ground floor there is the first double room with two single beds, the living room with the fireplace and the kitchen. On the upper floor are the two (2) double rooms, one with two single beds and the other with a double bed and a fireplace. Each room has its own bathroom, air conditioning and central heating. The rooms do not have their own mini-refrigerators, separate TVs and WiFi hotspot access. In the courtyard of the Mansion there is a lovely garden of rose flowers and trees to surround it.